You have 60 minutes to capture your website visitor’s attention. Within that timeframe, nearly 75% of your customers will visit your site, make a decision on what to buy, and complete the checkout process. If they don’t, chances are, they’ll move on. Regardless of the device a customer uses or the channel from which a customer is referred, nearly 75% of all purchases will be made in that window. And you’ll end up learning whether your customer acquisition and retention costs were worth it. Given the enormity of this statistic, we’re taking an in-depth look at that first hour in this EQ: what happens when, how customers behave, and what you should be doing to convert the most customers possible. When measured by sheer volume, the most popular time for a purchase to occur is between the fifth and eighth minutes of a customer’s session. When measured against time-specific traffic levels, more people are adding products to their cart in the final five minutes of that hour-long window. Relative to traffic, purchase activity peaks during minutes 35 through 50. 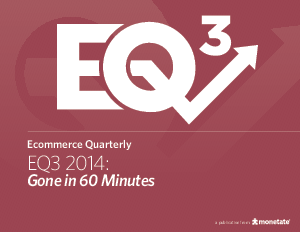 From minute 61 forward, each key metric—product pageviews, add-to-cart rates, conversions—goes into a steady decline. Though plenty of this data can be classified as simply “interesting,” it’s also actionable. Knowing how much on-site time, exactly, it takes a customer to convert opens up a whole playbook for improving their experience.